Bath tubs, plumbing pipes and skillets are a few of the products manufactured with cast iron. Cast iron's strength and reduced frictional wearing allow these and other products to have a long life. Breaking cast iron creates smaller pieces of material to move and throw away. 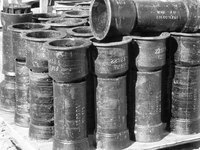 Although strong, cast iron will snap along scored lines or weak spots when subjected to direct blunt force. Clear an area large enough for you to break the cast iron object. Lay a tarp on the ground to collect cast iron pieces and to protect the area underneath the object. Set the cast iron in the center of the tarp covering the ground. Cover the cast iron with a tarp to contain fragmented pieces of metal. Strike the covered cast iron with a sledgehammer. Lift the tarp. Examine the cast iron for fractures if it did not already break into pieces. Recover the cast iron with the tarp. Strike the cast iron roughly in the area of noticeable fractures. Continue to strike and inspect the cast iron until it has broken into pieces. Remove the tarp from the broken cast iron. Place the tip of a cold chisel on larger cast iron pieces that did not break with the sledgehammer. Hit the back of the chisel with a hammer. Move the chisel along the cast iron pieces while striking it with the hammer until the larger pieces break. Continue with the chisel and hammer until the cast iron breaks into manageable pieces.